Gravel and adventure riding blurs the line between road and mountain biking. Bikes like the Parlee Chebacco and Open UP are capable of handling everything from smooth tarmac roads to the bumpiest forest paths and loosest gravel tracks. CHOOSING GRAVEL TYRES - WHAT WIDTH AND TREAD PATTERN IS RIGHT FOR YOU? Gravel - THE MOST FUN YOU CAN HAVE WITH YOUR CYCLING SHOES ON? Riding off-road is a lot more demanding on the rider and bikes than smooth road climbs. 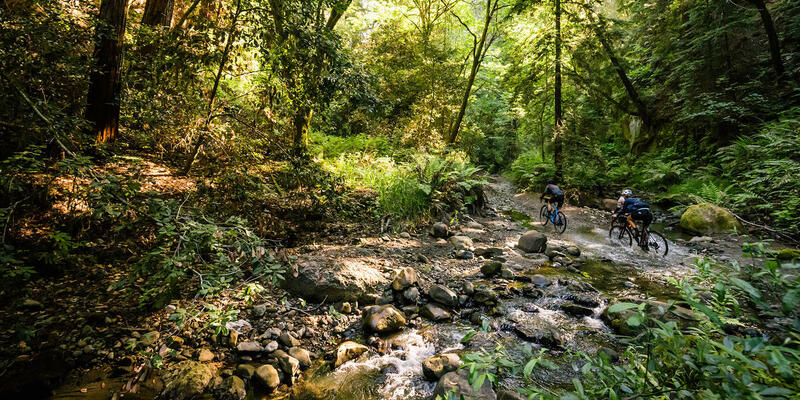 The climbs are often steeper and on tricky terrain, with the condition of the trails varying from sunbaked gravel roads to waterlogged swamps. The trails often vary dramatically in gradient as well, so you need gearing that can cope with those steepest grinds to flat out blasts and everything in-between. Unless you're riding very flat gravel roads, it's likely you'll encounter steeper terrain than you would on the road. Therefore lower gears are an advantage. It's an even more pressing matter if you plan to go bikepacking with the extra weight of sleeping bags and tents making the case for lower gears, even more of a priority. Lower gears let you spin rather than grind up the steep and long climbs, but you still want a decent top-end for those times when you have a fast descent or tailwind to enjoy. At the time of writing, there is only one brand producing a dedicated gravel groupset, and that is SRAM; with Force, Rival and Apex, in descending order of price. SRAM was the first to market a dedicated 1x groupset, first for mountain bikes then cyclocross and swiftly followed by gravel bikes. SRAM's groupset combines a clutch-style rear derailleur and a chainring with alternating narrow and wide teeth that together provide increased chain retention. 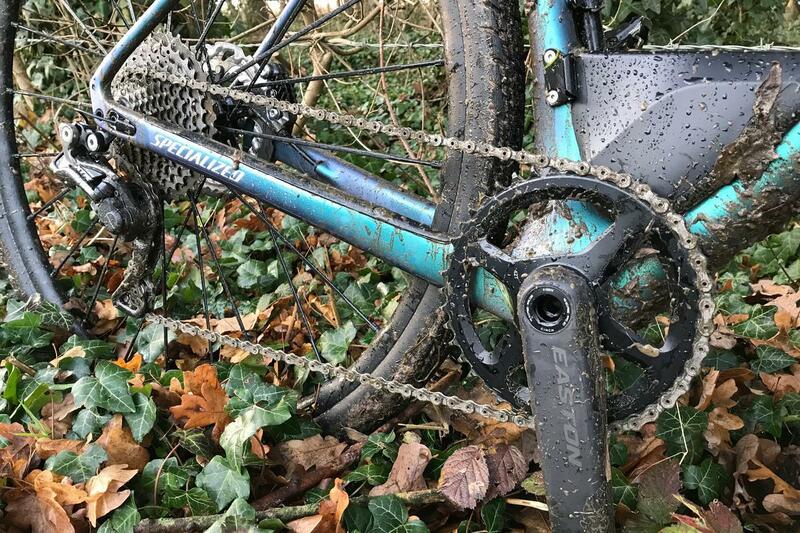 Simply put, these two key features aim to prevent the chain dropping off when riding over bumpy terrain in the absence of the front derailleur. 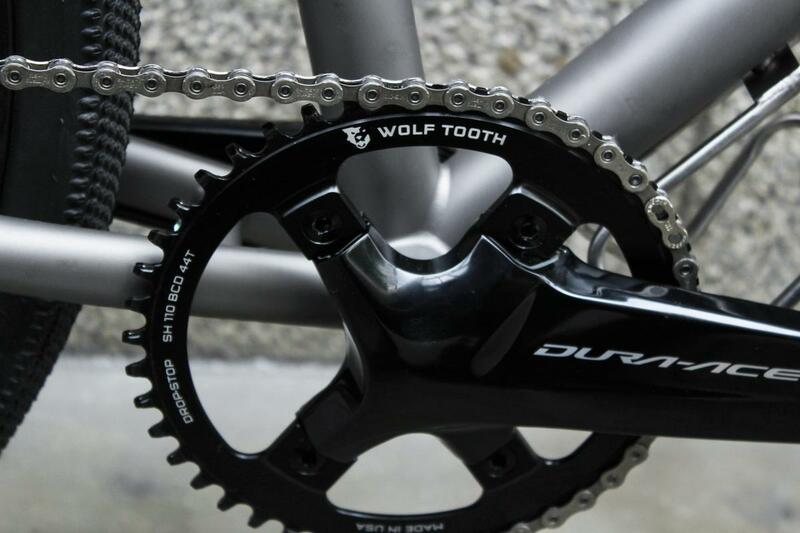 It also provides a wide range of ratios due to the massive 10-42t cassette. Combine that huge cassette with a 40t chainring and you have a bailout gear easier than 1:1 but still enough at the top-end to hit 50kph, and everything in-between to deal with any terrain you might encounter on an off-road trail. 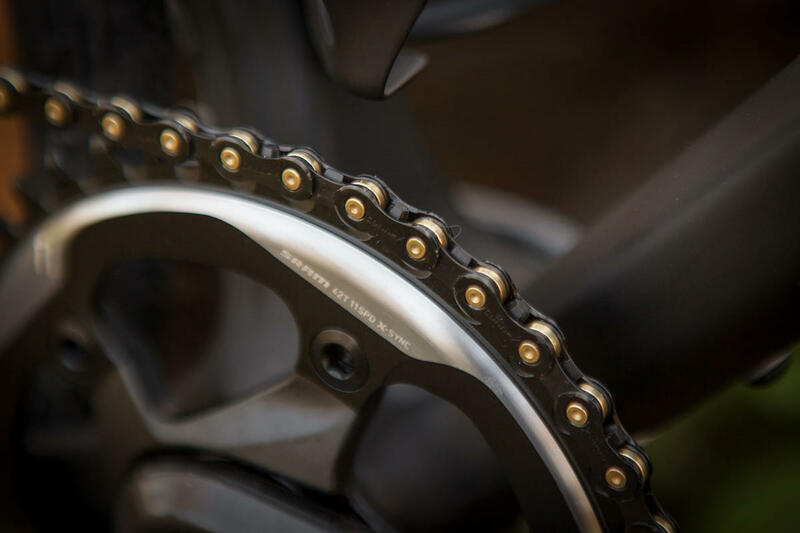 SRAM offers chainring sizes down to 28t (using a direct mount X-SYNC MTB chainring) providing plenty of scope for spinning up those steep climbs. But 1x isn't perfect. There are bigger gaps between a lot of the sprockets and while the simplicity argument is a good one (one less mech and gear cable to go wrong) the modern front derailleur is impressively reliable. With the advent of electronic shifting, such as Shimano's Di2, front shifting has never been as good as it is now. So why get rid of a perfectly functioning component? There are good reasons for keeping it and the main one is smaller gaps between the sprockets and two chainrings to provide a wide range of ratios. Shimano doesn't (yet) make a dedicated gravel bike groupset, but the large majority of production gravel bikes are being specced with compact 50/34t chainsets and 11-32t or 11-34t cassettes, the latter being the largest a Shimano road rear derailleur can accommodate. In many cases, especially if the terrain you want to ride is largely flat, a 2x setup works adequately. The more tightly spaced sprockets help you pick a suitable gear to match your cadence. But a stock Shimano groupset doesn't let you achieve the same low gears as easily. It might help to put some numbers on it. A 50/34 and 11-32t setup has a lowest gear of 28.46in and a highest of 123in. That lowest gear really isn't that low if you're tackling long gravel climbs. In comparison, a SRAM 1x 40x42 gives a 25.51in lowest gear, and that difference is going to help you towards the end of a long gravel ride. There are a few options for customising a 2x Shimano drivetrain to achieve a more suitable spread of gears for gravel and adventure riding though. 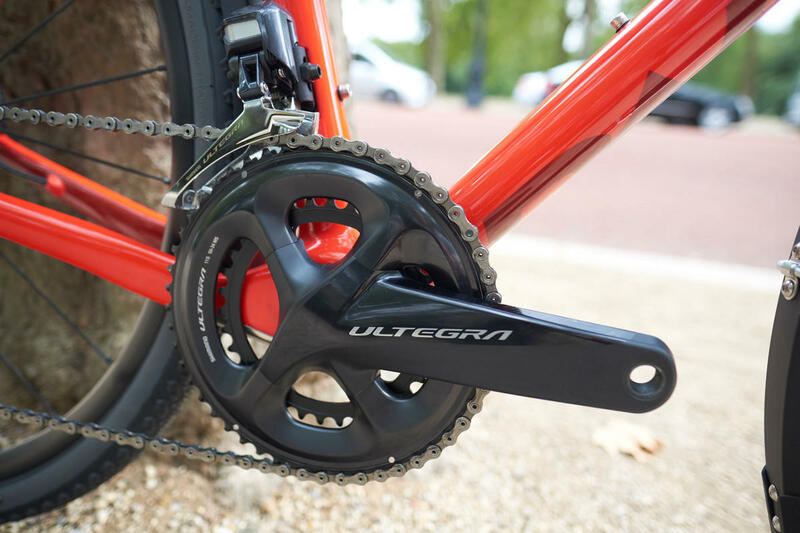 Swapping the Shimano compact chainset for one of the new breed of sub-compact chainsets aimed at adventure and gravel riding lets you go much lower. 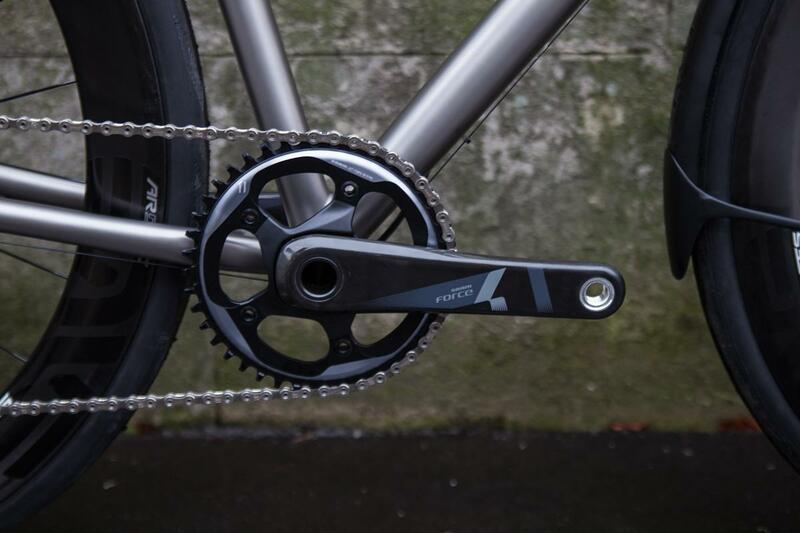 Praxis and FSA both offer a range of choices, with a 46/30t combining with an 11-34t cassette to provide a 23.63in low gear, still with a 112.32in gear that will let you hit 50kph at 90rpm. That's a much more usable range of gears, critically with a very low gear, to help you on steep gradients. If you're prepared to dip into the mountain bike parts bin, you can combine Shimano Di2 shifters with a Deore XT or XTR Di2 electronic rear derailleur and an 11-40t or 11-42t mountain bike cassette to create a 2x drivetrain with a much wider range of lower gears suitable for off-road terrain. Another option if you want to go 1x with Shimano is to emulate the stunning Specialized S-Works Diverge build. A Shimano Deore XT or XTR Di2 rear mech combined with an 11-40t cassette and a single ring chainset produces a slick shifting 1x drivetrain. Ultimately, the choice of 1x versus 2x really comes down to personal preference, the sort of riding you want to do and the type of terrain you intend (planned or not) to tackle, and whether you'll be loading your bike with bikepacking bags. There are pros and cons to each: 1x has easier lower gears but bigger gaps and one less part to fail; 2x has closer ratios but trickier to get lower gears. For riding on flatter terrain, it's hard to beat a 2x setup. The main benefit is the smaller gaps between the gears, and the two chainrings to adjust your approach to the upcoming terrain and keep the chain in the middle of the cassette where the gaps are smallest. 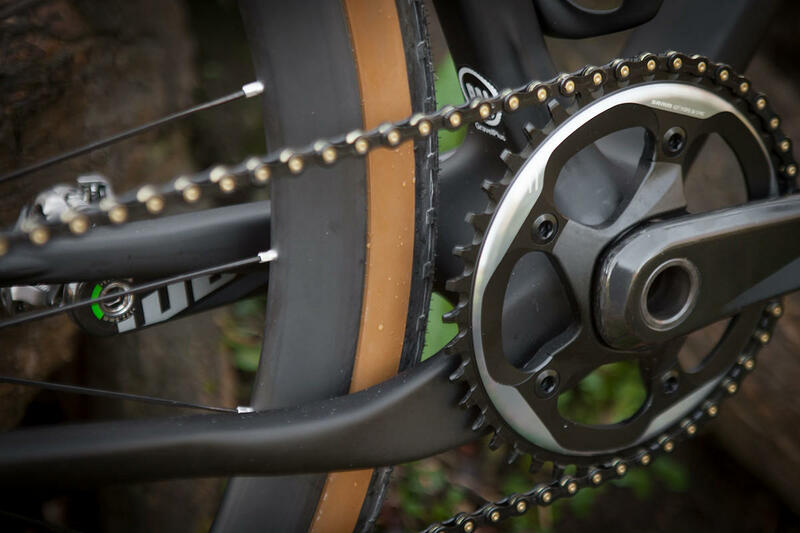 Lots of people like the simplicity of a 1x drivetrain though and don't mind the compromise in slightly bigger gaps between sprockets and sacrificing a bit of range to achieve lower gears. If you're wanting to ride really hilly off-road trails with varying gradients and especially if you might be saddling your bike up with luggage, then low gears are a bonus and 1x simply makes it easier to achieve a lower set of ratios with the small disadvantage of slightly bigger gaps. In summary, 1x makes it easier to achieve lower gears and provides a simpler setup with one less component to fail, while 2x suits fast and flat terrain with close ratio cassettes for those cyclists that demand to be at the perfect cadence all the time. Still unsure? Whether you're buying a complete bike "off the peg" or speccing up a custom build, part of the Bespoke process is to ensure that you have the right specification for your individual requirements, alongside the perfect fit. If you're looking to get a new bike, or update an existing one, get in touch.